Many factors play a role in the development of cancer. Because the liver filters blood from all parts of the body, cancer cells from elsewhere can lodge in the liver and start to grow. Cancers that begin in the gastrointestinal tract (gut) often spread to the liver. Liver cells can regenerate after injury (scarring that can occur as a result of liver disease). Sometimes the regeneration of liver cells is associated with changes (mutations) that have been linked to the development of liver cancers. How are liver tumours classified? There are many types of liver tumours, only some of which are cancers. The most important classification is whether the tumours are benign (relatively harmless) or malignant (cancer, i.e., capable of spreading from the liver and thus more serious). Hemangioma is the most common type of benign liver tumour. It is an abnormal growth of blood vessels of the liver that begins in the fetus. Between 10% and 20% of people in Canada have hemangiomas in the liver. Most people with hemangiomas have no symptoms and require no treatment. Some hemangiomas may rarely enlarge, and some may bleed in which case they need to be surgically removed. Hepatic adenomas are benign tumours of liver cells. Most do not cause symptoms and do not need treatment. Some, however, have the potential to become cancers. Often doctors will suggest a biopsy (removal of a sample of tissue of the liver nodule or mass) to assess the potential for cancer development. If a tumour is large, it may cause pain or blood loss and may need to be removed. Hepatic adenomas occur more often in women and seem to be triggered in some cases by the birth control pill or by pregnancy. Focal nodular hyperplasia (FNH) is a tumour-like growth of several different cell types. Although FNH tumours are benign, it can be hard to distinguish them from liver cancers. The most common form of primary liver cancer (cancer that starts in the liver) in adults is called hepatocellular carcinoma (HCC). It is a cancer of liver cells. This type of cancer can have different growth patterns. Some begin as a single tumour that grows larger. It may spread to other parts of the liver in later stages of the disease. Liver cancer may also develop in more than one site in the liver and may grow into multiple tumours. This pattern is most often seen in people with liver cirrhosis (scarring). Another type of liver cancer is called cholangiocarcinoma. It originates in the small bile ducts which are tubes that carry bile from the liver to the gallbladder. Most often, however, when cancer occurs in the liver, it did not start there, but spread to the liver from a cancer that began somewhere else in the body. These types of cancers are named after the place where they originated (primary site) and are considered secondary liver cancers or cancer metastases. For example, cancer that started in the lung and spread to the liver is called metastatic lung cancer with spread to the liver. Primary liver cancers account for less than 1% of all cancers in North America whereas, in Africa, Southeast Asia, and China, they may account for up to 50% of cancers. The high prevalence of people living in these areas carrying the hepatitis B virus and having liver cirrhosis may account for this geographic discrepancy. Worldwide, primary liver cancers are the third most common cause of cancer death. Liver metastasis is cancer that started in another part of the body and spread to the liver. This kind of cancer is also called secondary liver cancer. This type of cancers is 30 times more common than primary liver cancers. Can children get liver cancer? Among those with chronic liver disease, men are more likely to develop liver cancer than are women. The reason for this is unknown. Chronic viral infection of the liver with either hepatitis B or hepatitis C may lead to the development of cancer. Certain types of inherited liver disease such as hemochromatosis, which results in accumulation of too much iron in the liver, as well as alpha-1 antitrypsin deficiency, and tyrosinemia can lead to the development of liver cancer later in life. Cirrhosis is the formation of scar tissue in the liver. This can often lead to cancer. Major causes of liver cirrhosis include alcohol use, chronic hepatitis B and C, and non-alcoholic steatohepatitis (NASH). Most causes of cirrhosis are also associated with the development of liver cancer. Excessive alcohol intake is a known risk factor for the development of alcoholic cirrhosis and liver cancer. Obesity is a significant cause of non-alcoholic fatty liver disease (NAFLD) and its more severe form called NASH. People who have NAFLD or NASH have an increased risk of developing liver cancer. Tobacco use increases the risk of liver cancer if you already have a chronic liver disease. Long-term use of anabolic steroids can increase the risk of liver cancer. Are there treatments for hepatocellular carcinoma (HCC)? The treatment of HCC depends on the extent of tumour spread (stage), the speed of tumour growth, and the overall health condition of the person. Staging (determining the size and extent of growth of the tumours) is often done by imaging of the body, including CT scans, MRIs, and bone scans. Small primary cancers of the liver are curable. Cure rates generally decrease as the tumour size increases. Treatment of liver cancer may involve surgery, radiation therapy and chemotherapy or liver transplantation. Surgery is best for individuals who have good liver function or for those with tumours small enough to be safely removed. A small liver tumour can be surgically removed by a procedure known as a partial hepatectomy, in which a piece of the liver containing the tumour is removed. If all of the cancer can be removed, a patient has a good outlook for survival. If the cancer is too large, is found in many different parts of the liver, has spread beyond the liver, or if the person has other serious illnesses, it may not be possible to remove it completely. For many people with cirrhosis, there is not enough healthy liver left to allow the removal of even a small part of the liver. In this case, surgery is not an option. Side effects of a hepatectomy may include fatigue, pain, weakness, and short-term liver failure. An ablation is a form of localized treatment which refers to methods that destroy a tumour without removing it. This method can cure small localized primary liver cancer. Examples include destroying the tumour by using high-energy radio waves and heating cancer cells (radiofrequency ablation, or RFA), destroying the tumour by exposing it to high temperatures from microwaves (microwave therapy), destroying the tumour through the use of electrodes that send electrical pulses to the tumour (electroporation therapy), freezing the tumour with a very cold metal probe (acetic acid ablation or cryoablation), or injecting alcohol directly into the tumour to kill cancer cells (percutaneous ethanol ablation). Side effects and possible complications of tumour ablation may include abdominal pain, liver infection, and internal bleeding. When surgery or ablation cannot be used, embolization is next in line. It is a form of localized therapy. In embolization, the blood supply to the cancer can be reduced by blocking or reducing blood flow of the hepatic artery (the artery that feeds liver tumours as well as healthy liver tissue). This will, in turn, stop the growth of the tumour because it is not receiving any oxygen of nutrient supply. This can be achieved with chemoembolization or radioembolization (described below). In both those procedures, a small incision is made in the inner thigh, and a small tube (catheter) is placed directly in the artery to deliver substances that block the tumour’s blood flow. Because this kind of treatment often reduces blood supply to healthy liver tissue, it can be dangerous for people with diseases such as hepatitis or cirrhosis. Embolization is not useful if cancer has spread outside of the liver. Chemoembolization involves combining embolization with the delivery of strong anti-cancer drugs (chemotherapy) to kill tumour cells locally. This is referred to as transcatheter arterial chemoembolization (TACE). Chemoembolization prolongs life in people in whom cure is not possible. Radioembolization involves combining embolization with the delivery of beads filled with radiation to kill tumour cells locally. This treatment is sometimes referred to as transarterial radioembolization (TARE). Radioembolization prolongs life in people in whom cure is not possible. Side effects and possible complications of embolization may include abdominal pain, liver infection and fever, nausea, blood clots, and gallbladder inflammation. Radiation therapy is a treatment that uses high-energy rays (such as x-rays) to kill, shrink or prevent the growth of cancer cells. This type of treatment may also be used to provide relief from symptoms, but it does not cure liver cancer. Studies to show that radiation therapy prolongs life have not yet been done. The two types of radiation therapy include external radiation and internal radiation. External radiation sends high-energy rays from outside of the body through a machine and targets the cancer cells. In internal radiation, radioactive substances such as seeds, needles, wires or catheters are placed near or at the cancer site in the body. Side effects of external radiation therapy may include nausea and vomiting, fatigue, low blood cell count, skin changes. Chemotherapy refers to the use of medications to kill cancer cells. Usually, the drugs are given intravenously (into a vein) or taken by mouth. Liver cancer does not respond well to most conventional chemotherapy drugs. These medications target specific abnormalities within the cancer cells (their genes, protein, tissue characteristics) without harming normal cells. Their use is limited in people who remain active and well, and who do not have liver failure. These medications prolong survival in people whose cancer is not curable. Examples of these kinds of medication are lenvatinib (Lenvima) and sorafenib (Nexavar). Both medications work at stopping the spread of cancer, by blocking an abnormal protein in cancer cells that signal rapid multiplication. Lenvatinib comes in the form of a capsule (which is NOT to be opened) that is taken by mouth once a day with or without food. Some side effects of lenvatinib may include fatigue, itchiness, skin peeling, nausea, heartburn, constipation and more. Sorafenib comes in the form of a tablet that is taken by mouth twice a day, an hour before meals. Some side effects of sorafenib may include fatigue, weakness, red skin, itching, loss of appetite, diarrhea and more. Immunotherapies act on specific parts of the immune system to better fight cancer cells. These medications are not considered as first-line therapy for the treatment of primary liver cancer (HCC). Examples include nivolumab (Opdivo), and regorafenib (Stivarga). Nivolumab is given via the intravenous (into the vein) route every two weeks. Some side effects may include fatigue, low white blood cell count, low sodium levels, coughing, loss of appetite, and shortness of breath. Regorafenib is taken by mouth, once a day and with a low-fat meal. Some side effects may include fatigue, low calcium, phosphorus and iron, loss of appetite, low white blood cell count, high liver enzymes. There are also other immunotherapy medications which are being studied for their role in the treatment of HCC. Are people with liver cancer considered for liver transplantation? Most cancers of the liver begin elsewhere in the body and are spread to the liver. These cancers are not curable through liver transplantation. Tumours that start in the liver are usually detected in an advanced stage. They are also rarely cured by a liver transplant. If the primary liver cancer is small (a single tumour less than 5 cm in diameter, or alternatively, up to 3 small tumours, each less than 3 cm in diameter) and confined to the liver, a liver transplant may be considered. Are their treatments for secondary liver cancers? The liver is involved in approximately one-third of all cancers and often those that begin in the gastrointestinal tract, colon, pancreas, breast and lung. The risk factors involved in this type of liver cancer are numerous given that the cancers start elsewhere. The prognosis for people with secondary liver tumours depends on the primary site of malignancy. In general, people do not live longer than one year from the diagnosis of cancer spreading to the liver (hepatic metastases). Treatments for secondary liver cancers remain unsatisfactory but include surgery, chemotherapy, immunotherapy, and embolization. 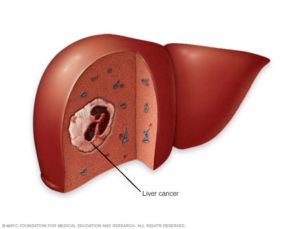 Can primary liver cancer be prevented? Prevention is the best defence against primary liver cancer. Worldwide, the most common risk factors for primary liver cancer are chronic hepatitis B and C infections. Therefore, the prevention of these forms of liver disease is essential. The Canadian Liver Foundation recommends that all children, as well as adults at high risk of being exposed to the virus, should be vaccinated against hepatitis B. Since there is no vaccine against hepatitis C, it is crucial to prevent the spread of this disease and to identify and assess all those who are already infected with the hepatitis C virus for treatment. The Canadian Liver Foundation recommends that all people with risk factors and adults born between 1945 and 1975 should get tested for hepatitis C.
Alcohol intake should be limited to no more than one to two standard drinks per day. Drinking alcohol every day, as well as binge drinking, can be harmful to your liver. If you already have a liver disease, the safest amount of alcohol is no alcohol at all. As mentioned earlier, non-alcoholic fatty liver disease (NAFLD) and its most severe form, non-alcoholic steatohepatitis (NASH) can lead to liver cancer. It is important to maintain a healthy body weight, eat a well-balanced diet, and introduce exercise into your daily routine. People at high risk of liver cancer should be checked by their doctor regularly to increase the chances of early detection. Early detection of small liver cancers dramatically enhances the chances of being cured by using techniques such as radiofrequency ablation. Everyone who is at risk of developing primary liver cancer should undergo regular checkups by ultrasonography at six-month intervals. The discovery of abnormal screening ultrasound results should prompt a visit to a liver specialist. The Canadian Liver Foundation funds research into the causes, diagnosis, prevention and treatment of all forms of liver disease including liver cancer. Scientists are looking for the causes of liver cancer, ways to prevent it and methods to improve treatments. Prevention of new viral hepatitis infections and better treatments for chronic hepatitis could prevent about half of liver cancer cases worldwide. New methods that combine treatments with surgery or other types of treatment are being studied. Caregivers have a unique role in caring for their loved ones with strong commitment, patience and love. They are responsible for a wide range of tasks that their loved ones are no longer capable of doing for themselves. These tasks require a great deal of physical and emotional support, and often financial support. This complex role requires caregivers to develop unique interpersonal and practical skills. With this, come new challenges which can cause caregivers to feel overwhelmed and burnt-out. The following liver cancer resources will hopefully help you ease the load and burden you as a caregiver face by providing you information, strategies and recommendations to facilitate this important and noble journey. For additional caregiver-specific resources please click here. What you can do to help manage the symptoms of liver cancer? Try alternative therapies that may help your loved one with pain reduction such as acupuncture, relaxation, meditation and massage therapy. Please note that any use of complementary and alternative medicine should be done in consultation with your healthcare provider. Encourage your loved one to sit up straight to take pressure off the liver and abdominal area (belly). Provide a diet high in fibre to reduce the absorption of ammonia, to decrease its build up in the brain. Read more about hepatic encephalopathy. Help your loved one keep physically active to maintain brain health; they can enjoy walking, swimming, gardening, stretching and other types of physical activity. For more information about nutrition in cirrhosis, please read our publication. Prevent your loved one from getting too hungry before they eat because hunger can make nausea worse. This support resource gives you and your loved one somewhere to turn for answers after diagnosis, helps you understand your disease, and provides you with the resources you need. Please call 1 (800) 563-5483 Monday to Friday from 9 AM to 5 PM EST. This is a national network of people living with liver disease who have offered to share their experiences with others. It was developed by the Canadian Liver Foundation to link Canadians like you who have a family member who has liver disease, who care for someone who suffers from liver disease, or who have been diagnosed with a liver disease, to talk about your concerns with a peer in a similar situation. If you would like to be connected with a peer supporter in your area or would like to join the peer support network, please call the National Help Line or email clf@liver.ca. A forum for people living with liver disease and their families to connect in person, learn about their disease and discover how to cope. The program consists of sessions covering topics ranging from nutrition and exercise to treatments and transplantation. Guest speakers include liver specialists, social workers, nutritionists, psychotherapists, liver transplant nurses and kinesiologists. To find a program in your area, click here. Click here to get in touch with a Canadian Liver Foundation contact located all over Canada. Learn more about support groups and events that may be happening somewhere near you. It is important to know that there is help available for both you and your loved one. Below are some additional resources that may be of interest to you.